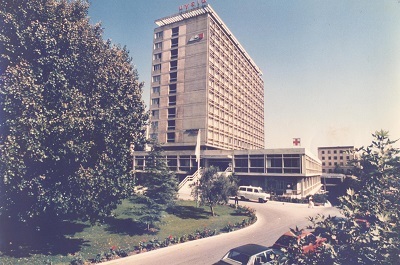 HYGEIA Hospital was the first large Private Hospital to be established in Greece that has been operating in Greece since 1975. It is currently one of the largest private hospital units in the country. 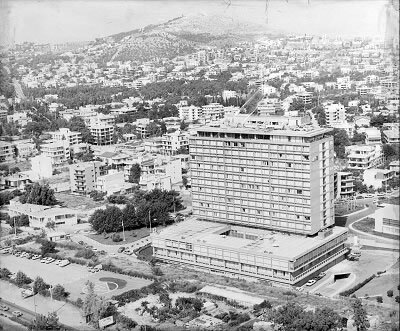 It was founded in 1970 by a group of Greek physicians; their aim was creating a model hospital in Greece. To this day, HYGEIA continues to set the pace, mainly striving to provide top-level services and develop a network of integrated healthcare services both in Greece and abroad. HYGEIA was the first hospital in Greece to undertake a heart transplant operation, the first to treat an HIV patient, and the first throughout Europe to carry out implantation of radioactive particles in prostate cancer. In addition, the successful separation of Siamese twins in May 1989 provided two people with an independent personal life. HYGEIA Hospital’s primary goal has been to offer top-quality services at the cutting edge of medical science and technology, as well as to develop an integrated network of healthcare services both in Greece and abroad. HYGEIA Hospitalis pleased to announce it has become the headquarters for theArrhythmia and Electrophysiology Review (AER), with Dr Demosthenes Katritsis, Director of the HYGEIA Hospital 3rd Cardiology Clinic, as Editor-in-Chief. The Journal is published in partnership with the European Heart Rhythm Association (EHRA) of the European Society of Cardiology and is widely popular in the field of arrhythmology. 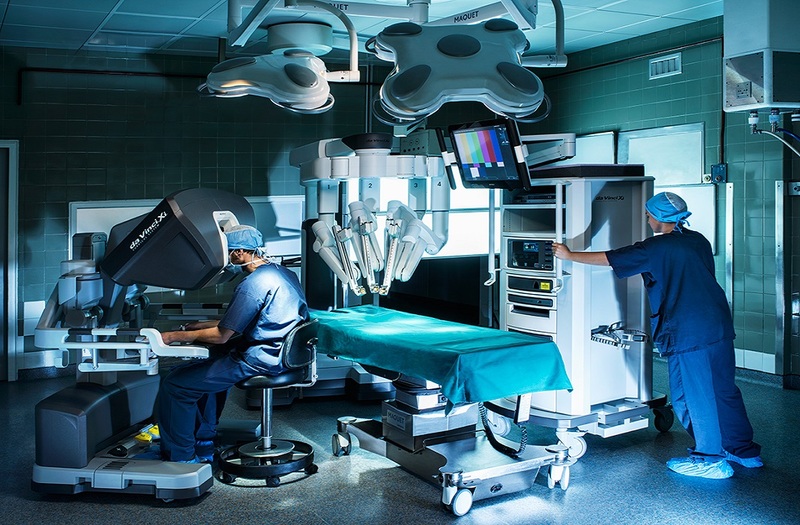 A patient with endometrial cancer underwent a new surgical procedure at HYGEIA Hospitalfor the first time in Greece by using the latest generation Da Vinci Xi robotic system. The robotic hysterectomy and sentinel lymph node biopsy were performed using Indocyanine Green (ICG) dye. Diagnostic & Therapeutic Center of Athens HYGEIA SA has been included among the 21 innovative companies evaluated in the first edition of the Sustainability Performance Directory, by the QualityNet Foundation in Greece. The21 companiesthat were named Most Sustainable Companies in Greece for 2017 have been included among the elite of the Greek business community, after being evaluated and ranked based on their non-financial performance and their overall approach when it comes to sustainability issues. The Hospital’s 6th Department of Surgery is the only Center of Excellence in Greece, in the field of Colorectal Surgery. Accordingly, the chief of the Department, Dr Constantinos S. Mavrantonis, has been awarded the title of Master Surgeon in Colorectal Surgery. HYGEIA has become the only hospital in Greece to receive an award for its positive work environment for a 3rdtime, as it was ranked among the top companies listed asBest Workplaces 2018. HYGEIA achieved this distinction following a survey that included 49 companies with a total of 22,300 salaried employees. Note that the companies are awarded mainly based on answers provided by the employees themselves. Integrated Firefly technology was used for the first time in Greece to perform partial nephrectomy, with the latest generation da Vinci Xi robotic system at HYGEIA Hospital. Specifically, ICG fluorescent dye was administered intravenously to a 61-year-old patient with a 4.5 cm tumor in the right kidney, perioperatively. Then using the da Vinci Xi robotic system with integrated Firefly technology available at HYGEIA Hospital, it was possible to remove the renal tumor with healthy margins and without incisions, while the remaining renal parenchyma was spared. The all new MAKO Robotic Arm Assisted system is already launched in HYGEIA hospital recently. This unique system is manufactured in USA and is extremely useful for high precision knee and hip replacement. MAKO system can assist the trained orthopaedic surgeon to perform total hip, partial knee and total knee replacement procedures. The new PET/CT imaging technique using 18F-PSMA radiopharmaceutical offers early staging of prostate cancer. The exam is performed at HYGEIA Hospital. It is an imaging technique that provides greater diagnostic accuracy compared to the scans performed currently. The PSMA (prostate specific membrane antigen) is a transmembrane protein located in the prostate gland cells. Its connection to radioisotopes makes it possible to trace the extent of the disease in patients with prostate cancer recurrence, ensuring more accurate and targeted diagnosis. 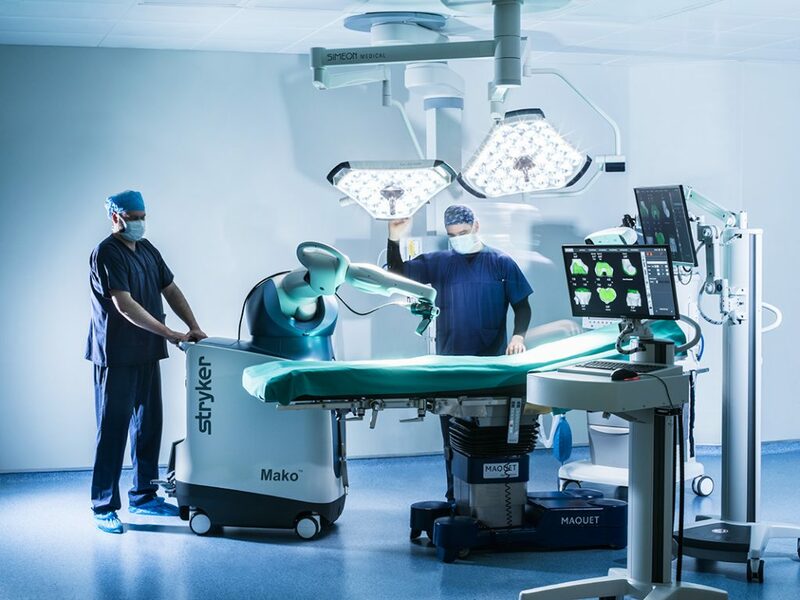 A robotic procedure for debulking of ovarian cancer was performed for the first time in Greece at HYGEIA Hospital, using the latest generation da Vinci Xi system. The patient recovered well and was discharged from hospital 24 hours later, in excellent clinical condition. The benefits of laparoscopic surgery and robot-assisted techniques, such as this one, include fast recovery of patients who are already weakened by chemotherapy, and faster reinstatement of postoperative chemotherapy, which normally is delayed by 4-6 weeks, until the incision has healed. Hygeia Group today announced that it has adopted IBM’s Watson for Oncology (WFO), with an aim to provide oncology patients at HYGEIA hospital with modern, personalized, and evidence-based treatment options. IBM Watson for Oncology, trained by Memorial Sloan Kettering Cancer Center in the U.S, will support the clinical decision-making of HYGEIA Group’s oncologists by identifying cancer treatment options supported by evidence from more than 300 medical journals, more than 200 textbooks, and nearly 15 million pages of text providing insight and comprehensive details on different treatment options, including key information on drug treatment selections and utilizing National Comprehensive Cancer Network® (NCCN®) U.S. guidelines. Watson for Oncology will provide individual oncologists or Tumor Board with an up-to-date decision support system. Guided by its support for the values and principles of sportsmanship and the Olympic spirit, HYGEIA Group has been actively supporting the athletes of the Greek Olympic Team, offering free-of-charge healthcare services and assisting them in their preparations for the Tokyo 2020 Summer Olympics. HYGEIA Group traveled to the remote island of Symi and the municipality of Argithea to provide free-of-charge medical services to the local residents. HYGEIA has become an international academic medical center, after striking a significant partnership with the European University Cyprus School of Medicine. This 10-year partnership will contribute in educating and training Medicine students, exchanging know-how on clinical practice and education, promoting common-interest activities, and launching academic and educational initiatives in the field of Medicine. Always looking to enhance its research activities and continuously upgrade the health services it offers its patients, HYGEIA Group signed a strategic agreement with Clinerionin the area of clinical trials. Clinerion has the largest information exchange network worldwide between healthcare providers and pharmaceutical companies, aiming to expedite the clinical trial and drug development processes, and ensure prompt access of patients to innovative treatment methods. A new and innovative method for diagnosis of cerebrospinal fluid (CSF) disorders by Likvor CELDA® system has been introduced for first time in Greece. The method was presented during a scientific meeting with title “Dementia and Assessment of Cerebrospinal Fluid Dynamics”, held at the “N. Louros” Conference Center of HYGEIA Group. Taking advantage of the cutting-edge technology in its hospitals, as well as its leading scientific and nursing staff, HYGEIA Group has established the Oncology Center. The Center offers access to the most advanced oncology and surgery departments, dedicated imaging, diagnosis and treatment departments, the state-of-the-art Radiation Oncology Center, the only Gamma Knife Brain Radiosurgery Department in Greece and the Child & Adolescent Oncology Center, while it applies all the latest methods and protocols. These were some of the points raised during the All About Oncology event hosted by HYGEIA Group at the Athens Concert Hall on November. HYGEIA Group received an honorary distinction for its Traveling for HealthCorporate Social Responsibility initiative at the 9th annual BRAVO Sustainability Awards. The ceremony took place on Tuesday December 11 at the Athens Concert Hall.This CSR initiative was distinguished in the Bravo Society It was among 100 business community candidates that received the highest ranking after the social dialogue with 9,250 active citizens and 130 social partners who participated in the Evaluation Committees. The 1st Greek Tourism Workshop 2018was successfully concluded in India, with HYGEIA Groupparticipating in the event. The main aim of the workshop was to boost patient inflow, especially from the Indian tourism market. India is one of the largest economies globally, with continuously rising demand for Greek tourism services. The Greek Tourism Workshop 2018 was successfully concluded in Kuwait, with HYGEIA Group participating in the event. The Workshop was hosted at Sheraton Kuwait Hotel in Kuwait City. Kuwait has one of the healthiest economies among the countries in the Middle East and the main aim of the event was to increase the number of incoming Kuwaiti travelers to Greece. As part of HYGEIA Group’s strategy to expand its services to new markets abroad, HYGEIA Group hospitals HYGEIA and MITERA participated in the IMTJ (International Medical Travel Journal) Medical Travel Summit 2018 that was held for the first time in Athens, Greece. Around 330 representatives from local and international hospitals, IVF clinics, dental practices, associations and medical tourism agencies, as well as government representatives and business advisors attended the Summit. Hellenic Healthcare Single-Member Holdings SA company was informed for the acquisition of 90,542,970 shares of the Hygeia Hospital, which correspond to approximately 29.62%. HYGEIA Hospital has been awarded the 2016 Best International Hospital Award for Greece by the International Healthcare Commission (IHC). The first awake video-assisted thoracic surgery (VATS) in Greece to remove a lung tumor, without administration of general anesthesia, was successfully performed at HYGEIA Hospital. An innovative fusion imaging system has been installed at the HYGEIA Hospital General Ultrasounds Department, offering superior quality healthcare services for prostate cancer. Robot-Assisted Partial Nephrectomy & Intraoperative Ultrasound. Maximum safety for patients with kidney cancer. A partial nephrectomy procedure using the da Vinci® robotic system in combination with high-resolution laparoscopic intraoperative ultrasound offer significant benefits to patients suffering from kidney cancer. HYGEIA Group unveiled its 5th consecutive Corporate Social Responsibility (CSR) Report, which records the responsible business conduct that distinguishes all of the Group activities. The 2016 CSR Report is the first to have been prepared in line with the Global Reporting Initiative (GRI) G4 Sustainability Reporting Guidelines, Core level, and is accompanied by a statement from an independent auditor providing assurance as to this. The new FilmArray 2.0 System is installed at the Clinical Labs of HYGEIA Hospital, revolutionizing the management of infections. The HYGEIA Hospital Hepatobiliary Surgery Department offers comprehensive management of liver cancer patients. The HYGEIA Hospital Radiation Oncology Center became a European Reference Center after the latest agreement signed with Elekta, due to its unique, advanced equipment and the toplevel services it offers for cancer treatment. It is also the only one in Greece to have been selected by the International RadioSurgery Association (IRSA) as a Center of Excellence for Stereotactic Radiotherapy & Radiosurgery. 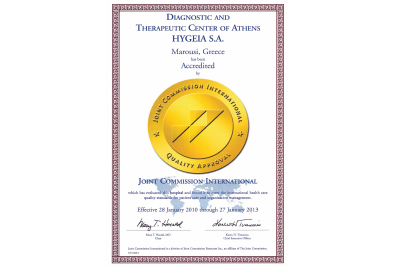 HYGEIA is the only hospital in Greece accredited by the Joint Commission International (JCI). It has renewed its Joint Commission International (JCI) accreditation for another three years and remains the only hospital in Greece to have received this distinction by the most distinguished and internationally recognized Accreditation Standard for Healthcare Organizations. Super Glue treatment with VenaSeal, the latest minimally invasive and pain free treatment for varicose veins, is being performed for the first time in Greece at Hygeia Hospital. VenaSeal is the first and only system that uses intravascular glue (cyanoacrylate) to seal and obliterate the vessels that cause varicose veins. An innovative breast radiotherapy method that spares the heart and lungs has been introduced at HYGEIA Hospital, for the first time in Greece. The first implantation of a leadless pacemaker is successfully performed at HYGEIA Hospital by Cardiologists-Electrophysiologists of HYGEIA Hospital’s Electrophysiology, Pacemaker and Defibrillator Department. The leadless pacemaker has brought revolution in pacemaker technology. The first comprehensive Department for Endoscopic Paranasal & Skull Base Surgery (Endoscopic Skull base Athens – ESA) in Greece is inaugurated at HYGEIA Hospital and offers specialized treatment for the entire range of conditions affecting the nose, the paranasal sinuses and the skull base. HYGEIA Group is ushering in a new era in Clinical Microbiology. 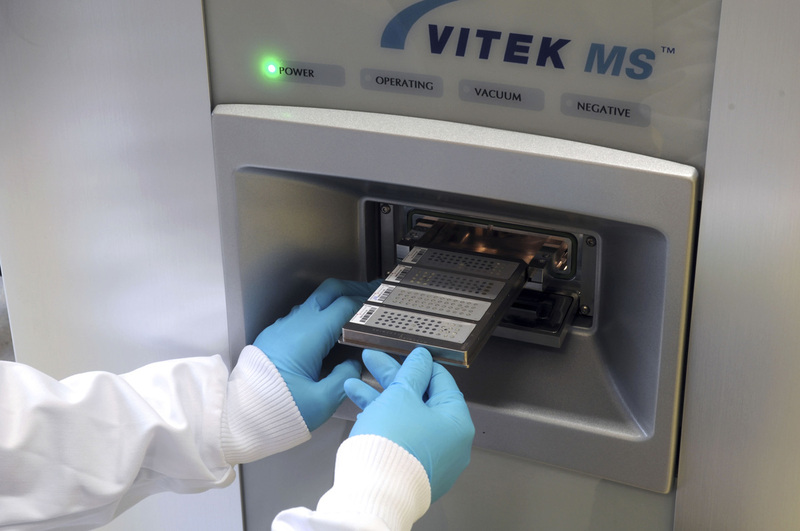 It installed and operates the first VITEK MS MALDI TOF in the Clinical Labs of HYGEIA Hospital. 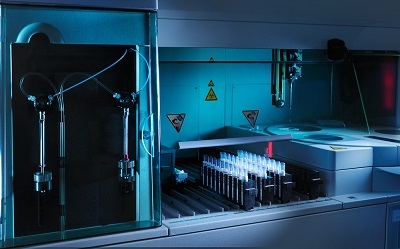 This technology allows fast microbial identification from clinical samples, providing valuable information rapidly, so as to select the best antibiotic treatment, as well as proceed with the most suitable actions when managing epidemics and limiting the spread of infections. 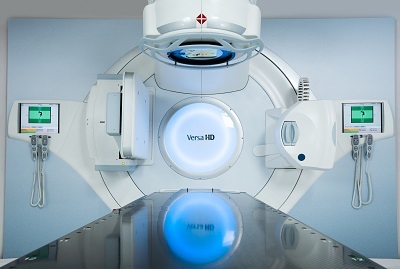 The new groundbreaking Versa HD linear accelerator (for the Radiotherapy & Oncology Center) is installed, the first one of its kind in Greece and the Balkans. 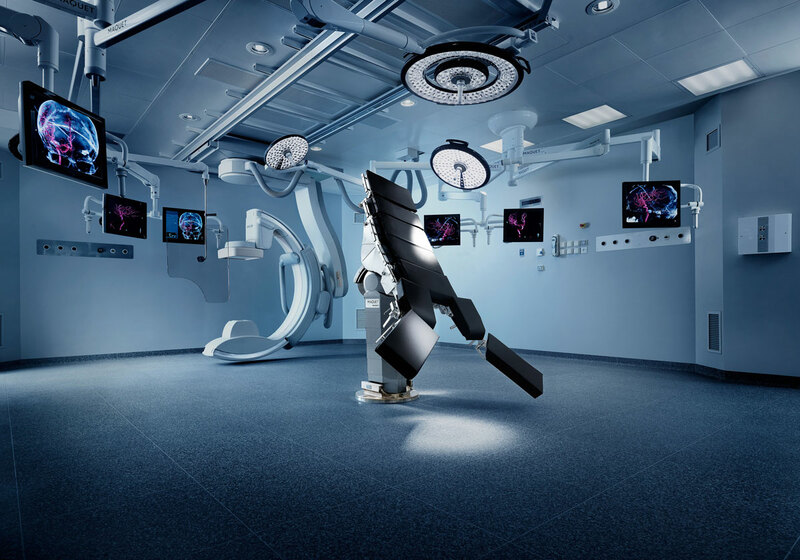 Erato, a state of the art virtual presence robot, assists patients & visitors. HYGEIA Hospital is ranked among the best hospitals in the world, after receiving the Best Hospitals Worldwide 2014 Certificate by the Diplomatic Council (DC), a foundation that follows the principles of the United Nations Charter. HYGEIA Hospital receives the “Employer of the Year Award” in the prestigious European Business Awards 2012/13 finals and is recognized as the leading employer in Europe. ΗYGEIA Hospital receives an award for its positive work environment for the 2nd time, as it is ranked among the top companies listed as Best Workplaces 2013. HYGEIA Group expands its business to the medical cosmetology industry, launching a new specialized line of cosmetics, Beatific. A novel transcatheter valve implantation offering treatment to selected patients suffering from aortic valve insufficiency. HYGEIA Hospital is among the leaders in medical technology worldwide, after the inauguration of its Latest Generation Multidisciplinary Hybrid Operating Room, the first one of its kind in Greece. Two Major Awards for HYGEIA Hospital: “Best company in Greece in Corporate Governance” award by World Finance, the prestigious international journal, & “Exceptional Work Environment”, becoming the first Hospital in Greece to be awarded for its exceptional work environment, since it was included among the top companies in the Best Workplaces’ 2011 ranking. ΗYGEIA Hospital is implementing the latest generation treatment protocols through Sellas Clinical Research Center, following an exclusive affiliation agreement between Sellas and the hospitals HYGEIA, MITERA and HYGEIA Hospital Tirana. This affiliation aims at securing increasing access of patients suffering from serious illnesses to the most innovative treatment and medical research options, through an integrated network of doctors and clinical researchers. HYGEIA Group announces its disinvestment from Turkey, reflecting its strategy to focus on the operation of hospitals in which the Group maintains absolute majority and management control in order to ensure a high standard of quality of the healthcare services provided. HYGEIA Hospital is certified (from 2010 to 2014) by TEMOS (Organization Certifying Medical Tourism Services), in order to expand its healthcare services in Greece to an international level. Computer-Assisted Neuronavigation surgery to correct congenital scoliosis. Innovative transcutaneous method for mitral valve repair using the MitraClip System. HYGEIA becomes the only Hospital in Greece to receive the JCI (Joint Commission International) accreditation, after thorough preparation. HYGEIA acquires state-of-the-art equipment: Leksell Gamma Knife Perfection. It also hosts the 15th conference of the Leksell Gamma Knife Society. HYGEIA Hospital Tirana begins operating on July 1. Interventional Radiology: Revolutionary new endovascular techniques cure 70-80% of patients with “diabetic foot”. γ- Knife radiosurgery: New, improved, effective and totally painless method for the treatment of brain tumors. HYGEIA Hospital Tirana is under construction; it is situated at the junction of Tirana’s most central streets, occupying a space of 25.000 square meters. A modern One-Day Treatment Unit (Chemotherapy) is established on the 5th floor of the Hospital. It can accommodate up to 27 individual patients and is equipped with CCTV. Nucler Medicine Department is equipped with the state-of-the-art γ-Camer Brightview XCT (hybrid imaging system). Removal of fibromas with Da Vinci® S.
Incisionless Robotic Surgery for Thyroid Removal with Da Vinci® S.
Staging of uterine cancer through robotic surgery for the first time in Greece. Implantation of Rechargeable Neurostimulator in patients with mobility problems. HYGEIA Group acquires two private hospitals in Cyprus: Achilleion Hospital (Limmasol) and Evangelismos Hospital (Pafos). HYGEIA Group acquires 50% of capital share of SAFAK Group Hospitals in Turkey. Stem Health Unirea SA is founded in Romania. HYGEIA Hospital installs new equipment: da Vinci ® S Robotic Surgery System, CT-Scan, Digital Mammography and Robotic Linear Accelerators. A new health informatics system is installed throughout the HYGEIA Group Hospitals. Use of the Vagus Nerve Stimulation (VNS) method and application of the “Deep Brain Stimulation (DBS)” for the supplementary treatment of patients with resistant depression. Surgery for spinal cord stabilization (spinal fusion) with neuronavigation system of the last generation. Metabolic Surgery for Obesity and type II Diabetes. Surgery with Robotically Guided Microscope: Neurosurgery for removal of brain tumors. On April 11, the Board of Directors of HYGEIA and MITERA decide to join forces and establish the most powerful private Healthcare Group in Greece, HYGEIA Group. On July 18, HYGEIA announces the acquisition of Achilleion Hospital in Cyprus. The HYGEIA Central Laboratories are certified to ISO 9001:2000. MARFIN CAPITAL SA acquires 49% of HYGEIA’s share capital and becomes its principal shareholder. In April, HYGEIA makes a strategic move by acquiring 24.83% of MITERA’s share capital, to further establish its presence as a dynamic private healthcare Group. The expansion of HYGEIA in Albania (October) constitutes the first private investment in Albania’s healthcare sector, with a total cost of 30 million euros. This business venture is the prelude of HYGEIA Group’s expansion in to other Balkan countries. The CT MRI & Osteoporosis Department is certified to ISO 9001: 2000. HYGEIA purchases all the medical equipment of HYGEIA OPTHALMOS – OPHTHALMOLOGY CENTER SA, which operates within HYGEIA and offers ophthalmological services with Excimer Laser. The HYGEIA Neurosurgery Clinic successfully organizes a postgraduate program, in affiliation with the Royal College of Surgeons, University of Erlangen and Harvard Medical International. The first workshop focused on cervical Spine Surgery (Prof R. Laing, Cambridge) and the second on Pituitary Gland Surgery (Prof R. Fahlbusch and Prof M. Buchfelder, Erlangen). Gamma Knife Brain Radiosurgery Department commences operation (March). It is the first of its kind in Greece. The Gamma Knife is an advanced technology device, which specializes in brain cancer treatments. PET-CT (Positron Emission Tomography – Computed Tomography) Department commences operation (June). It specializes in diagnosing neoplastic diseases and degenerative diseases of the brain (e.g. Alzheimer’s disease). In addition, it offers important information for specific conditions, such as accurately diagnosing cancer restaging. HYGEIA purchases all the medical and diagnostic equipment owned by affiliated companies and begins offering relevant services. The Physical Therapy and Rehabilitation Department is certified to ISO 9001: 2000. HYGEIA SA buys out the remaining 40% of ALAN MEDICAL SA. One of the hospital wards begins to operate as a Chemotherapy Unit, with immense success. The shares of HYGEIA SA are listed in the Athens Stock Exchange Market. The operation of HYGEIA’s subsidiary “DIAGNOSTIC AND THERAPEUTIC CENTER OF ATHENS HYGEIA SA AND GEORGIOS POLITAKIS GP” is suspended, and its activities are now performed by the Company. (September). HYGEIA increases its holding stake in “DIAGNOSTIC AND THERAPEUTIC CENTER OF ATHENS HYGEIA SA AND GEORGIOS POLITAKIS GP” to 99%. HYGEIA secures a 10% share in “HYGEIA – NUTRITION SOCIETE ANONYME”. It also secures a holding in the general partnership “DIAGNOSTIC AND THERAPEUTIC CENTER OF ATHENS HYGEIA SA AND GEORGIOS POLITAKIS GP”. Interventional neuroradiology, cerebral aneurism embolization, Cerebral angiomas embolization. Treatment of aortic aneurism endoluminal vascular prosthesis. Establishment of the Center for Radiotherapy and Oncology. HYGEIA keeps expanding its activities, with the acquisition of 30% of “HYGEIA EYE – OPHTHALMOLOGY CENTER SA”. HYGEIA secures 20% ownership of “MAGNETIC HYGEIA DIAGNOSTIC IMAGING SA”. 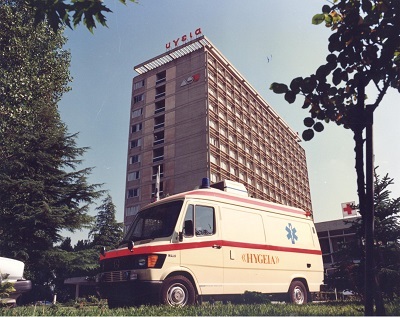 HYGEIA is the first hospital in Greece to undertake a heart transplant operation (April 3, 1990). Liquid Organ Transplant Unit (e.g. bone marrow). The Successful separation of Siamese twins in May 1989 provided two people with an independent personal life. Implantation of Intraocular lenses (IOL) for cataract. The Eastern Attica Prefecture grants the Hospital approval for the operation of new departments, as well as for an increase in bed capacity. HYGEIA receives an operating license for a General Hospital, with a capacity of 311 beds, in accordance with Decision No. KY5468/10.05.1975 by Attica Prefecture (Social Services Directorate). Introduction of preventive health Check-up. The Company constructs a building complex in the Municipality of Amarousio, where it begins providing top-quality medical and nursing services. HYGEIA SA is established under the name “Diagnostic and Therapeutic Center ATHENS ASTYKLINIKI SA” by a group of Greek physicians, led by N. Christeas.